As our school has made the transition to a competency-based system, many educators I have spoken to over the past two years have asked me “What is different about your school now?” This million-dollar question is one that I had not thought a lot about as I was living the change, but began to realize the answer through sharing our work with others. Over the past year, our school has had a number of national visitors, ranging from the Chief Council of State School Officers to the United States Education Department’s Ann Whelan and Emma Vadehra. As I have planned for, facilitated, and observed these visits, I began to realize exactly was different in Memorial School now as opposed to three to four years ago. During any visit our school has, we make sure that we don’t do any anything “special”, that we aren’t pretending to be someone we aren’t. We have typically had students (usually fifth graders) share their experiences about their understanding and knowledge of how skills and dispositions play a major role in their overall understanding of themselves as learners. In a competency-based system, reporting of progress in both academics and behaviors is done in a pure fashion (meaning they are separated, so as not to muddy what the reported grade represents) , so students and teachers know exactly which competencies, academic and non-academic, students have mastered. Additionally, we bring our visitors into a grade level to watch what we call LEAP (Learning for Each And every Person) to see our multi-tiered system of support in action. Providing and structuring these individualized opportunities for support or extension within the daily schedule is imperative in a competency-based model. Some have a very hard time visualizing what this might look like with five and six year-old students, so we tend to share Kindergarten LEAP, if it is occurring during the visit, so that we may demonstrate what it looks like to have an effective, differentiated structure of support and extension, even for our youngest learners. We typically end with a session providing time for our visitors to speak with and ask questions of those in our school who make everything happen-our teachers. Again, each visitor is coming with their own set of questions about what they would like to know, so we open it up immediately for them to ask anything they want. And this is what I would refer to as the depth, or 2/3 of the iceberg beneath the surface of the water. Our teachers’ understanding of curriculum, instruction, and assessment practices has grown tenfold over the past four to five years. When our teachers discuss any of these topics, it becomes incredibly clear what the difference is in our school now as opposed to three to four years ago. Each teacher is able to passionately and clearly articulate their understanding of not only best instructional and assessment practices related to the leverage standards and competencies students must demonstrate mastery of, but also the details of where each and every student in their classroom and grade level (the benefit of highly functioning PLCs) is and what they are doing to allow them to continue along their learning progression. This is where the true power of competency education becomes evident. What may look to be typical in an elementary classroom is truly much deeper than it may appear. Every center, conference, and activity is geared toward something greater, and students’ ownership and investment in their own learning is evident, as well. Getting to a point in which teachers are this aware of not only their students’ areas of strength and need but also their own, takes time, focused professional development, and a collaborative culture intent on realizing the growth and learning for all within the environment. This awareness and true understanding of their craft is the depth and power of a competency-based educational system. There has been a growing body of research related to the absolute necessity and import of these skills and dispositions within the overall learning process itself, with some suggesting that these skills are as important, if not more important, than the academic competencies we tend to focus on. I consider myself a very self-directed learner at this point in my life, but that has not always been the case. Throughout my K-12 experience, I went to class, attained pretty good grades, and moved on to my next class. I was always able to communicate and collaborate effectively, yet never was really pressed to direct my own learning, as I moved from class to class, studying as I needed to and completing the requirements needed to go to college. This inability to direct my own learning, however, caught up to me when I went to college. I was now expected and required to figure things out on my own, and I was unable to do that as effectively as I needed. It was no one’s fault but my own, but it resulted in learning a hard, yet incredibly valuable lesson. Ironically, I would learn this lesson from “teachers” and from an “education” that I still consider to be one of the most important ones I’ve ever had, and it didn’t occur in a school. On the eve of my twenty-first birthday, April 29th, 1993, I began my first night of Basic Training as an Infantryman in the United States Army. Yes, that’s right… I turned twenty-one sitting on a hard, wooden bench in the humidity of Fort Benning (or as we affectionately referred to it as, Fort Begin-Again), GA.
Obviously the skills of communicating, collaborating, and yes, even being creative are absolute necessities, but self-direction is a skill that is going to save you and your platoon-mates a LOT of push-ups. I consider myself to be a very quick learner, but the Army and my drill sergeants expected and required that we take responsibility for not only ourselves and our own learning, but for each other’s. If you didn’t demonstrate your understanding of something, you needed to study or work harder to be successful. If you didn’t understand a concept, or couldn’t do the required number of sit-ups or push-ups, or complete a run in the expected time, you studied, practiced, or exercised in any spare minute to get better at whatever it was you were struggling with. Failure was not an option, and their assessments were true performance assessments. You had to DO. We were faced with scenarios in which you were required to process the information provided very quickly, think critically, and respond appropriately, utilizing and applying what you had learned. I believe now, more than ever, that these are life skills that should translate to learners at all levels. At our elementary school, Memorial School in Newton, NH, I watch teachers at the primary level focusing more and more on our CARES behaviors (Cooperation, Assertion, Responsibility, Empathy, and Self-Regulation). Teachers are recognizing the absolute leverage that these skills and dispositions provide for students. And they can continue to grow and learn. Traditionally, these may not have been skills that were outright taught, but that is all changing. Carol Dweck’s research related to growth mindset has been a catalyst in changing many things, shedding light on the understanding that students (and adults) CAN continue to grow in ANY area, whether academic or behavioral. Even more powerful, when students are aware of their areas of strength and areas for growth and they become responsible for assessing their own growth within these skills and dispositions, this ownership and increased understanding will have potent results. School became much easier for me once I returned from my time in the military. I was older, yes, but I was also a highly self-directed learner. I knew what I had to do, and I developed a plan to accomplish it. I was reflective in my learning, and I identified not only where gaps may exist, but developed plans to remediate any areas for growth. Providing opportunities within our schools for students to practice, assess, and grow within these “other” competencies will not only allow students to become more complete learners, but will allow them to become the College and Career Ready adults that our workforce requires. These past two weeks have reminded me of something I have always known to be true in my gut and in my heart. Growth and success in schools is built upon a solid foundation of trust and an intrinsic culture of collaboration and mutual support. Recently, our district hosted two visits to our school and district from educators and policy makers from across the country, I listened to our teachers reiterate to our guests that it is imperative to be engaged in work in a place where you feel safe to take chances and know you will be supported. It seems so simple, yet we all know it is not something that just happens. It takes a lot of time, effort, and patience. It has traditionally been easier for people to work in isolation, rather than put themselves out there with a team and be mutually accountable for the success of ALL students. 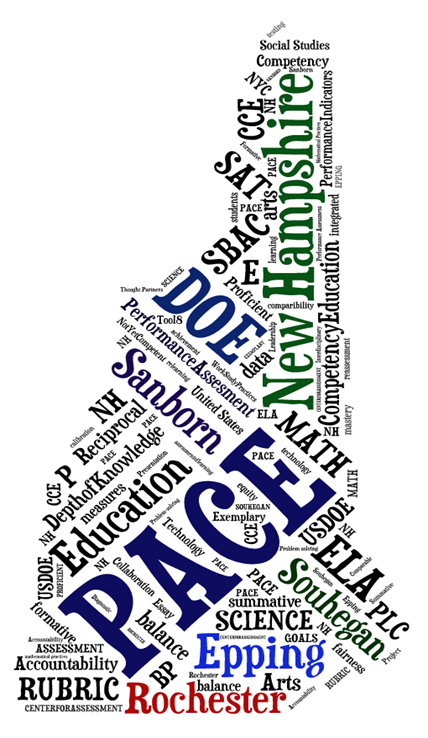 Our school and district (Memorial School and the Sanborn Regional School District), along with the Rochester School District, the Epping School District, and Souhegan High School, have been engaged in PACE (Performance Assessment for Competency Education) for over a year. PACE is a first-of-its-kind accountability waiver through ESEA, and was not approved by the federal government until March 5, 2015. The work leading up to this approval has been going on far longer. Our work in competency education evolved from a simple vision of trying to allow each student to reach his/her full potential in a supportive environment of “Learning for All” seven years ago. We made a commitment to each other that each child in our school was “our student”, not yours or mine. We made a commitment to focus on student issues, not adult issues (this was a big one!) The learning we all have experienced over these seven years has far exceeded what I could have ever imagined. First and foremost, our school continues to be a place in which students come first. I have always believed that happy, engaged students will be more successful students. But each of us has grown professionally in a way that is difficult to quantify. Our teachers’ depth of knowledge and understanding related to instruction and especially assessment has grown exponentially in the past few years. Many of our visitors see a somewhat traditional school at first glance. Upon looking a little closer, the true depth of our teachers’ work becomes more apparent. Through speaking with our students, who are able to articulate their learning trajectory in a thoughtful manner, or our teachers, who are able to articulate their practice and understanding of the learning progressions for their students to a very high degree, visitors begin to develop a picture of how the work that we have been engaged in for many years is having a transformative impact on practice. I was reflecting on a story told by Craig Kielburger during the iNACOL conference last week. Mr. Kielburger was sharing a story related to leadership, and referencing the job of a sheep herder. He shared an example of how leaders aren’t out in front, but rather are in the back, ensuring that everyone is moving forward together, similar to how a sheep herder must be amongst the sheep encouraging them to all move forward. This struck me, because it is a perfect example of the responsibility each of us has for all students in our schools. We are all leaders in our schools. Therefore, it is our collective responsibility to ensure that we are providing support for those within our schools to continue to move forward. As building or district leaders, we can affect these types of changes within our schools and districts, but it is, and always will be, teachers who have the greatest impact in the classroom when provided the support and trust to do what they do best. The commitment of our district, the Sanborn Regional School District in New Hampshire, to build highly functioning Professional Learning Communities within each school has been the driving force behind the significant changes that have taken place in Sanborn over the past five-plus years. Professional Learning Communities are the foundation for any of the work we have been engaged in during this time. Our success in implementing a competency-based educational system within our district is evidence of this PLC work, and would not be as successful without our interdependent teams working together as they have. At Sanborn, we have applied the 4 Critical Questions for Consideration to guide our work around competencies within our schools. Throughout our journey, these four questions have assisted us in ensuring we are providing appropriate and meaningful opportunities for all of our students to demonstrate competency. 1.) What is it we expect students to learn? • Our teachers are now crystal clear about what students are expected to know and demonstrate in their learning. This should never be a mystery, and through backwards design planning, the outcomes for any unit are established and made clear to our learners. • Our teachers increased understanding of competencies ensures a guaranteed and viable curriculum. Our district has K-12 high-leverage competencies that guide the learning for our students. Underneath the umbrella of the competencies and within the assessment itself, teachers identify the leverage standards that will be assessed within each assessment. 2.) How will we know when students have learned it? • Team-designed rubrics outline precisely what students are expected to know. Competency is the ability for students to “transfer” their learning in and across content areas, therefore, our teachers provide real-world problems and cross-curricular assessment opportunities for students to demonstrate this transfer of knowledge into other applicable situations. • Team-created common assessments are the driving force behind gathering data specific to each student’s progression of learning. This information is then collaboratively analyzed to inform the next instructional steps and learning pathways for each student. 3.) How will we respond when some students don’t learn it? • This component is imperative within any educational system committed to Learning for All. Our district has integrated multiple tiers of support, K-12, for all learners. Not learning foundational knowledge is not an option in our system. We have committed to providing the time and resources within our daily schedule at all levels to ensure ALL students learn, and do so at the highest levels possible. • Our schedules in each school allow students to receive additional instruction or support, depending upon the child’s particular needs. This occurs each school day during a Tier 2 time. We developed these schedules collaboratively with teacher leaders at each school to maximize the resources that are available within each grade level to allow for smaller group instruction for those students who benefit from it. • This is above and beyond what ALL students are exposed to during Tier 1, and students who may require additional support (a much smaller percentage) receive Tier 3 instruction, as well. 4.) How will we extend and enrich the learning for students who have demonstrated proficiency? • A competency-based educational system lends itself very well to those students needing challenge, as well. The same tiers that provide support provide various opportunities for extension. Students are provided opportunities to demonstrate a deeper depth of knowledge (Level 4 DOK) within their assignments, and are provided with opportunities to extend through personalized experiences. • This support also occurs during this “second tier” of instruction, but it is important to note that competency education by design allows for a more personalized approach to learning because students have an increased understanding of their own learning needs throughout the entire day. A majority of the “behind-the-scenes” work in a competency-based system is accomplished during PLCs. Teams must identify the competencies and anchor standards that are going to be assessed in their units of study, build performance assessments that truly assess these competencies, run these performance assessments through a “vetting” process for quality assurance, review and assess student work together, then revise/refine the assessment accordingly. In addition, teams of teachers must provide re-teaching and opportunities for extension based upon the assessment results. This must be coordinated within the teams to ensure that every student is receiving what he/she needs. Highly functioning Professional Learning Communities are imperative for this work to occur and for it to occur at high levels. The result? High levels of student growth and learning. This speech was given on May 22nd, 2015, during Memorial School’s annual Memorial Day assembly. Welcome, and good afternoon Veterans, Emergency Services Personnel, Students, Staff, Parents and Community Members. I would like to recognize our police and fire men and women joining us here today. Our emergency services personnel have dedicated their lives to keeping us safe every day in our community, and it is fitting to recognize each of the men and women here today. If you are serving as a police or fire man or woman, please stand to be recognized. And, I would like to especially thank our veterans. It gives me great pride to know that although, in some cases, we may only see each other a few times, if that much, a year, we come together, united by our service, to recognize our brothers and sisters who serve, have served, have sacrificed, and who have given their life to protect what we hold so dear. I had a student ask me earlier this week at lunch (very innocently, I might add), “I don’t know anyone who is in the military. Do those soldiers know about me?” I thought about it for a second, and I told her that anyone who serves is serving every citizen in the United States. I thought about it some more later, and I realized that I truly believe that a school encapsulates the many things that those who serve desire to protect. They exist right here in Memorial, and in schools just like ours, all across America. Hope: All of you amazing Memorial students represent the future of America. We believe and know that you will all be productive citizens in our communities, as you are right here in Memorial School. Our servicemen and women fight for our country to preserve that hope. Innocence: As a staff, we strive to allow each of our students to learn, make mistakes, grow, and hold onto being a child for as long as you are able. 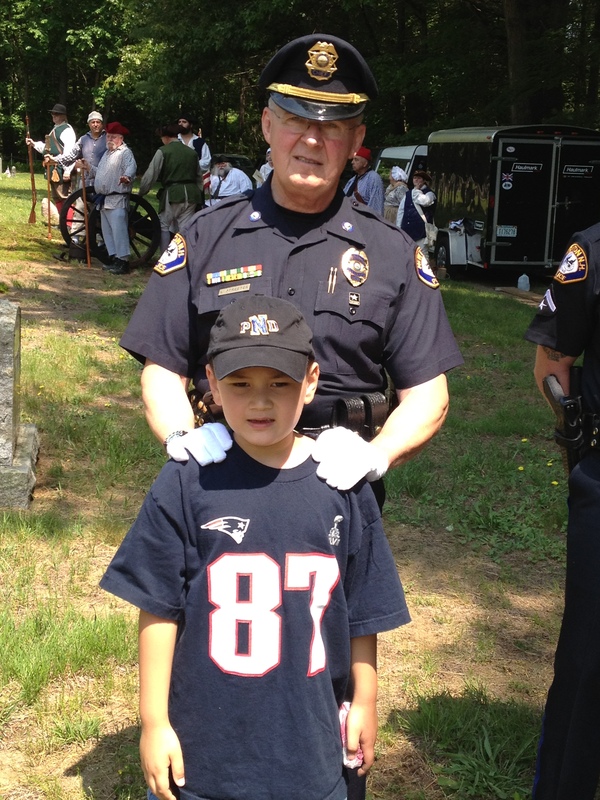 Those who serve do so to preserve our children’s innocence for as long as possible. Possibility: I share my favorite poem to kindergarteners and fifth graders every year. It is by Shel Silverstein and is called “Listen to the Musnt’s”. It is about what can be, and that is what America truly stands for. We encourage our children to reach for the stars, every single one of them, and the veterans seated before you today were willing to serve for that right for all Americans to reach for what can be. Family and Community: We know that family and community are integral to the fabric of our nation. Those who serve are not only serving for themselves, but are representing the many at home who, although they aren’t there in person, are there with the serviceman or woman in spirit. So, to answer our first grader’s question, they are representing and fighting for every person in this room. I am certainly thankful for that. Each year, we dedicate our assembly to someone who has served, and someone who has a connection to Memorial School and the Town of Newton. I’d like to read some information about a gentleman that I have come to know quite well, especially over the past seven years, and someone for whom I have a tremendous amount of respect. Chief Streeter entered the United States Army in 1967 at the age of 18. After completing basic and advanced training Chief Streeter was deployed to Korea during the “Pueblo” incident where he served as the Battalion Commander’s Driver in the 3rd Battalion, 32nd Infantry Regiment, 7th Infantry Division. Chief Streeter served in that capacity for ten months when he volunteered for service in the Republic of Viet Nam. Arriving in Viet Nam, having been promoted based on his previous assignment in a truck driver “MOS,” Chief Streeter who had previously never driven anything larger than a Jeep ended up driving a gasoline powered tractor trailer delivering 5,000 gallon loads of “JP-4” helicopter fuel to an Australian “outpost” called “Baria.” Chief Streeter served in that capacity for fourteen months, returning home from Phu Bai, Vietnam in February 1970, as a Specialist 5/E-5. At that time Chief Streeter joined the Salisbury Police Department as a part time officer while attending Northern Essex Community College and Northeastern University. Chief Streeter transferred to the Amesbury Police Department in 1976 where he served as a patrolman, plain clothes narcotics investigator, patrol sergeant and supervisor of detectives. During this time Chief Streeter also earned his master’s degree in Criminal Justice. In 1982 Chief Streeter was seriously wounded while on duty and spent five weeks in Massachusetts General Hospital. While in Mass General, Chief’s Streeter’s wife Cindy gave birth to their first child, Chad. Chad would later go on to serve with the United States Army, 82nd Airborne and was actually stationed in the same camp and same barracks location with the 2nd Infantry Division, Long Range Surveillance Detachment – Airborne, where Chief Streeter had been assigned thirty years earlier, Camp Casey. After thirteen years with the Amesbury Police Department, Chief Streeter returned to the Salisbury Police Department in 1988 as the Chief of Police. Chief Streeter served as the Salisbury Chief for fourteen years until reaching his maximum retirement entitlement in December of 2002. Chief Streeter came to Newton in that same month and year and is currently celebrating over fourteen years as the Police Chief for the Town of Newton. In Chief’s time leading the Newton Police Department, it has become one of NH’s eleven police departments to be state accredited in both 2007 and again in 2011. The Newton Police department will undergo a Nation Accreditation review process during this July and if successful will be again one of eleven in the State of NH and among only five percent of police department’s in the nation to attain that status. Chief Streeter is extremely and sincerely grateful for everything that he has been able to accomplish based on the sacrifices of so many that were never given the same opportunity(ies). It is my honor to present this flag, flown over Memorial School, to someone who continues to protect and serve-45 years in law enforcement-doing his best to keep our Memorial community and the community of Newton safe. Chief Larry Streeter. Boys and girls, on Monday, when we recognize Memorial Day officially, please take the time to thank a veteran. And please remember the many servicemen and women of our nations’ forces who gave the ultimate sacrifice, giving their lives so that we may be free. I continue to be amazed and impressed by our staff’s progress over the past five years related to our implementation of a competency-based education system. Our grading, assessment and instructional practices have changed significantly during this time, as our teachers have continued to push forward in their quest to impact student learning. Over the past two years, our focus has been on assessment. Our staff’s knowledge and growth related specifically to the assessment of students’ competency has grown significantly. Memorial School, an elementary school in Newton, NH, is part of the Sanborn Regional School District. 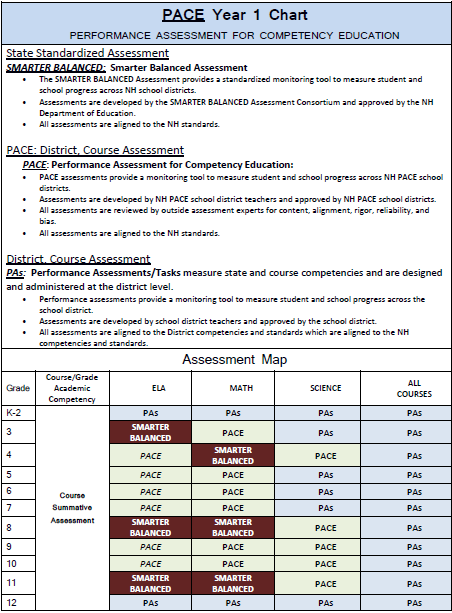 Sanborn was one of four districts to participate in a first-in-the-nation accountability strategy called PACE (Performance Assessment for Competency Education) that was recently approved by the US DOE. This joint venture between the NH DOE, the Center for Collaborative Education, the Center for Assessment and the four participating school districts (Sanborn, Epping, Rochester, and Souhegan) entails a reduced level of standardized testing (Smarter Balanced Assessment Consortium in NH) and involves the creation of locally developed, rigorous, comprehensive performance assessments by teams of teachers. These high quality performance assessments are designed to support deeper learning, and will be integrated within the units of study that students are currently engaged in, thereby creating no disruption to the learning process. The benefits of this work are numerous. First and foremost, this effort is reflective of educators at literally every level within the State of New Hampshire working in unison to better educational experiences for our students- from teachers in the classroom to Commissioner Virginia Barry and Deputy Commissioner Paul Leather. Everyone involved truly felt that a single standardized assessment should not be the only factor determining a school’s and its students’ success. In the PACE model, the standardized assessment for reading and mathematics would be taken once at each level (elementary, middle, and high school), with complex, multi-part performance assessments administered to allow students’ to demonstrate and apply their knowledge in quite sophisticated ways. The performance assessments were created by teams of teachers, and were developed as part of the units of study that students would be engaged in during the mid-March to May timeframe, thereby allowing the assessments to be integrated within the daily activities that students and teachers were engaged in. Additionally, the assessments have been vetted by local, state, and national assessment experts and have provided teachers with the opportunity to look at their assessments through a critical lens of their own, something they are doing now on a consistent basis. The concept of a performance assessment as an end-of-unit assessment was not necessarily “new” when we began our training through the Center for Collaborative Education and the NH DOE two years ago. Many of our staff had undergone professional development related to an Understanding by Design model and were utilizing this within their units of study. But what we were now learning required significantly more consideration of a number of factors as the assessments were being constructed. As our team of five educators went through the initial training, it became apparent to me as the building principal that we would need to take the process slowly, concentrating on each specific portion of the template to learn together how to build the best possible process for learning, as well as the best possible product to assess learning. We focused intensely on each stage of the process during the 2013-2014 school year (Looking at Our Work Through an Assessment Lens) and each team of teachers successfully built a Quality Performance Assessment by the end of the year. Our teachers, as they always do, have risen to the challenge yet again. A team-by-team report out during a recent team leaders’ meeting provided proof of our progress on building multiple performance assessments over the course of this past school year. Our school had set a goal to build, validate, administer, validate again through student work, refine, and submit three performance tasks within each grade level throughout the course of the year. Additionally, our specialists were responsible for going through this process with at least one task individually. Clearly, this process is an extensive one. It would not be possible to accomplish any of this without highly functioning Professional Learning Communities, as this work demands a collaborative effort from everyone involved. The majority of all of our professional time this school year has been dedicated to this work, and our knowledge of student learning, competency, and assessment of competency has grown extensively. Building multiple QPAs over the course of the year included the development of a common assessment that would be administered by specific grade levels at all schools within each of the PACE districts. 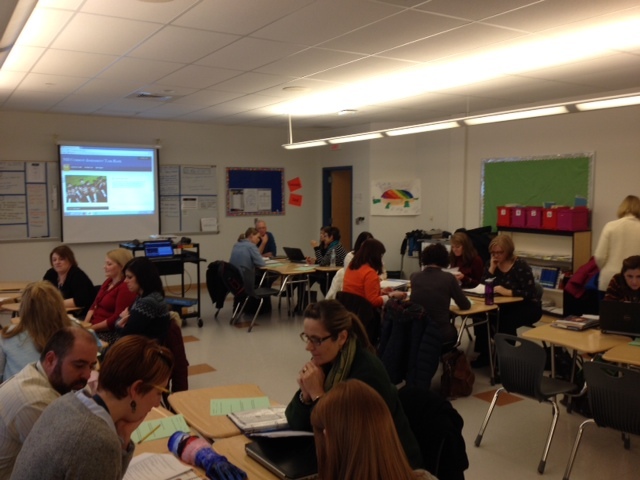 Teachers from each school from these specific grade levels met to collaboratively build the PACE assessments, then validated them within their own teams or as a PACE team, depending upon the grade level. At the elementary level, our third grade students took the Smarter Balanced ELA assessment and were administered a PACE Math assessment. Our fourth grade students took the Smarter Balanced Math assessment and were administered an ELA PACE task. Our fifth graders were administered both an ELA and Math PACE assessment. The chart below, shared by our Director of Curriculum, Ellen Hume-Howard, outlines each grade level’s responsibilities (K-12) related to PACE, Smarter Balanced Assessment Consortium, and ongoing district assessments. Rose Colby, Competency Education Specialist in NH, defines competency as “the ability to transfer content and skills in and across content areas.” During our team leader meeting, after each team member had reported out what they had accomplished, one of our teachers remarked that every summative assessment they were administering in their grade level was a performance assessment requiring students to demonstrate their competency through the transfer of their learning across content areas. This was a significant statement, because it is very clear to our teachers that the best performance assessments integrate multiple subject areas and are requiring students to be engaged in deeper levels of learning, precisely as Ms. Colby has described. Our teachers are now building cross-disciplinary assessments that require students to demonstrate varied competencies whereas initially we were generally focusing on one subject area. Our specialists play an integral role in building these assessments, and our classroom teachers are tapping into their expertise in PE and the arts to create learning experiences for students that truly span, and require proficiency in, multiple content areas. Furthermore, teachers recognize the incredibly powerful data they are gleaning from these types of assessments. Their assessment practices as a whole reflect this understanding, as performance assessments have become the norm. Teachers are building a bank of assessments that they will continue to go back to year after year. But each year, each assessment is scrutinized and further developed based off of what the needs of the students are, what worked well when the assessment was given last, and most importantly, the student work samples from the last assessment (student work doesn’t lie!). Our teachers continue to model our mission and guiding principal, “Learning for All.” They are refining their work on a continual basis, providing students with increasingly rich learning experiences, and creating assessments that are more consistently capturing our students’ ability to demonstrate their competency. And as their assessment literacy increases, instructional strategies and practices continue to develop. This has been a vital byproduct of our assessment focus. Students are provided more opportunities to demonstrate critical thinking at a higher depth of knowledge prior to the summative assessment. The formatives that are occurring along the way are providing vital information for teachers to provide the remediation and extension that each individual student needs. Our teachers are willing to continuously examine all practices and adjust as appropriate, because we realize that there will always be room for improvement. The work of creating the optimal learning experiences for our students is never done, just a work in perpetual progress. We have learned a lot over the past five years as our district has implemented a competency-based model of grading and assessing. Competency-based grading and assessment requires a significant shift in the way we think about assessment-its purpose and its meaning. Our school, Memorial School in Newton, NH and our district, the Sanborn Regional School District, moved to this model five years ago. We continue to learn more about what assessment of students truly means as our overall understanding of assessment practices (our assessment literacy) increases. When we moved to this model of grading and assessment, our elementary teachers made a wholesale change to grading with a four-point rubric. There would be no number scale (100 point scale) and there would be consistency across grade levels horizontally and vertically. The grade scale rubrics we used would identify the expectations around each level. We learned some things around the rubric scale itself and made the commitment early on to make changes to reflect this learning when it was appropriate. Our first year, we identified our rubric indicators as E (Exceeding), M (Meeting), IP (Inconsistent Progress), and LP (Limited Progress). The chart below reflects this first attempt at our rubric scale. The first roadblock came after the first progress report was distributed. As an educational staff, we looked at IP as what the descriptor outlined-inconsistent progress. A student was able to demonstrate competency, but it was on an inconsistent basis. Many parents provided feedback that it just “felt negative” (the word inconsistent). We decided that “In Progress” was also an accurate indicator, and parents agreed. We made the change immediately within the “Level” while keeping the performance descriptor the same. Many parents also immediately identified an “E” as equal to an “A”. This was understandable and something we actually had anticipated. If we were to line the two scales up side-by-side, the two would APPEAR to correlate, but I attempted to communicate time and time again that they were not the same. Parents wanted to hold their children accountable to getting all “E”s when in reality, we were striving for students getting to the level of “M”. A “Meeting” score truly demonstrated they were proficient in the competencies they needed to be. An E was really a difficult score to achieve. It demonstrated the transfer of a student’s understanding of the content to a very high level (Hess’ Cognitive Rigor Matrix). Our teachers’ growth related to Exemplary work was significant and continues to this day. We realized early on that we had not been providing the opportunities for students to demonstrate level 4 work within our assessment of their learning. Teachers recognized that in the traditional 100 point scale that we had used prior to moving to a competency-based system, a student who received a 100 was really “meeting” the standard. We were not providing true opportunities for students to demonstrate extended levels of competency through transfer of skills and problem solving required for a student who might now truly attain an “E”. With these realizations came some significant changes. Teachers were able to begin to recognize work specific to the various rubric scales. Differentiating between an IP (In Progress), and an “M” (Meeting) and an E (Exceeding) became easier, as we had work samples to dissect in our teams. Teachers built assessments that would allow students the opportunities to demonstrate a higher understanding of the content. Teachers recognized when looking at student work that their instruction may not have been at a level 3 and 4. Specifically, that students struggled when assessed through performance assessments that required level 3+ thinking when they hadn’t had a chance to practice that type of learning enough leading up to the assessment. They adjusted their instructional practices to ensure that students were assessed in ways that were consistent to their daily instruction. The learning curve when moving to a competency-based educational model is steep. As our Director of Curriculum, Ellen Hume-Howard, says, “It took us several years to find our Goldilocks (just right) scale.” Districts and schools must be willing to continuously examine their work, respond (when appropriate) to feedback from stakeholders, and continue to keep the learning and progression of students at the forefront when making decisions. This commitment will allow true understanding to take hold and for students to truly receive a personalized education based upon their individual needs.